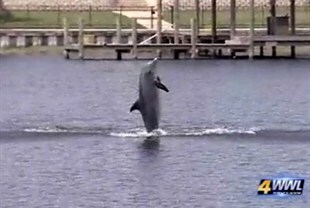 A lone male dolphin in New-Orleans lake has become a danger to swimmers – biting and head-butting them. The tragedy here is that for a dolphin this is normal behaviour. Growing up without dolphin company, this animal will apply its’ natural behaviour to the closest animals he has for play-mates: humans. Dolphins are justifiably famous for their intelligence but we must not forget that intelligence doesn’t make them like us. The swimmers and beach-goers who have been interacting with this dolphin for a bit of fun have contributed to the socially-inappropriate and dangerous behaviour we see now. We must never forget that their world is nothing like ours.